For many years Hurco has offered an easy conversational solution for programming simple 3D geometries, at the control, without the need for expensive CAD/CAM software…but with today’s WinMax control it’s even easier and more powerful than ever before! 3D Mold has been available since the early days of the Hurco UltiMax control, which offered operators the ability to program more advanced 3D features on the shop floor. The operator can simply describe any 2D shape, and then rotate that shape around the X-axis, rotate it around the Z-axis, or translate it along the Y-axis. Once the feature has been programmed, using one of the methods mentioned above, patterns can also be used - giving even more flexibility to the option and allowing for the rotated or translated features to be positioned or patterned in a variety of combinations. 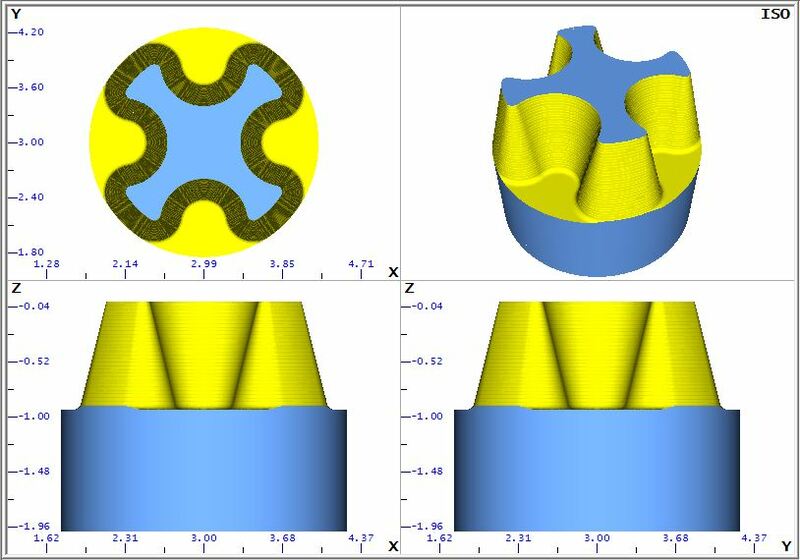 Over the years, as CAD/CAM software became more common, the popularity of 3D Mold began to subside. However, since the introduction of the Hurco WinMax control, the capability of programming advanced 3D geometry has been enhanced, and the possible uses for this type of simple conversational programming began to re-emerge. 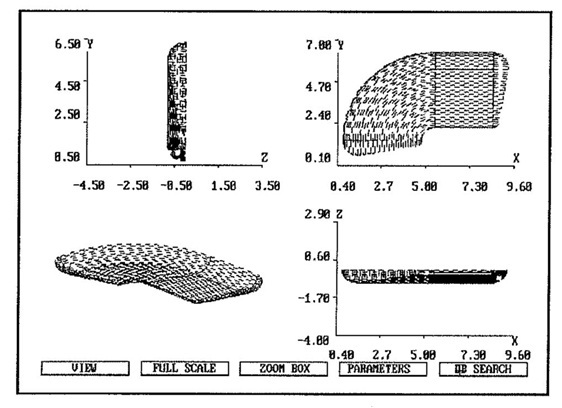 Although 3D Mold is still available today, it has been packaged with the even more powerful Swept Surface software option…which allows the operator to describe a single two dimensional shape as the sweeping contour, and a second two dimensional shape to be used as the along contour. A common analogy used to describe this functionality is using a router bit (sweeping contour) - to add a decretive shape to the edge of an odd shaped piece of material (the along contour). 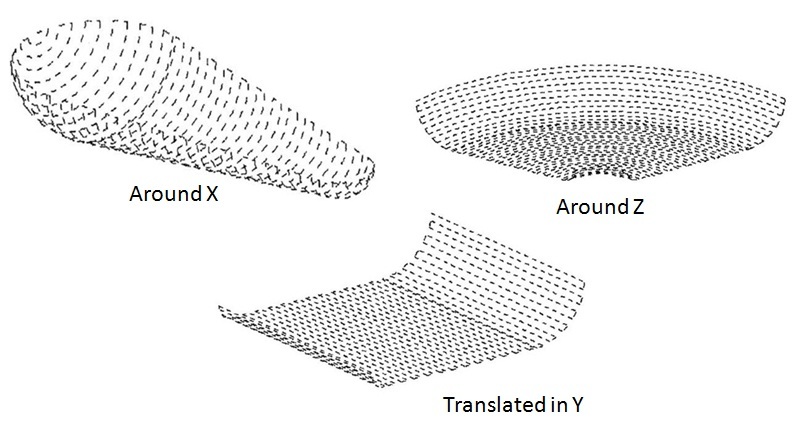 In the image below, the sweeping contour is a single angled line that creates the taper along the walls, and the along contour is the "star-shaped" feature. 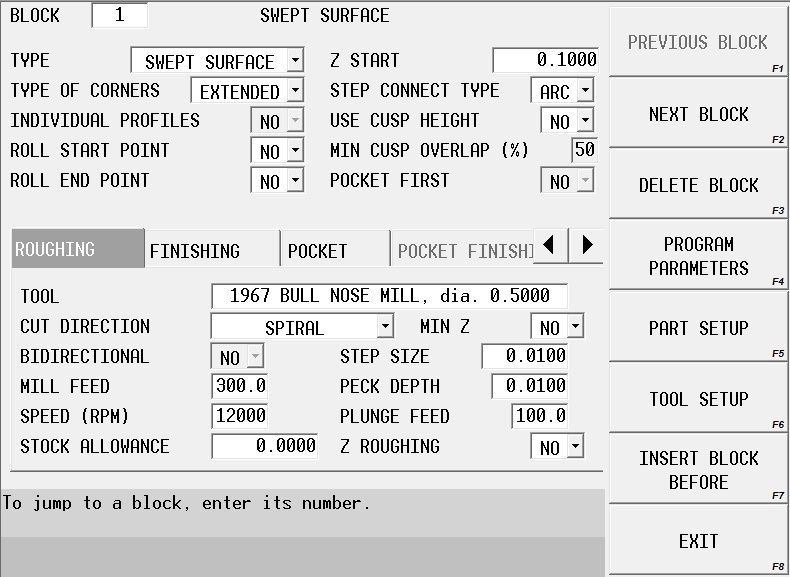 In addition to allowing the machine to cut the desired feature along the programmed direction of the contour, or to have it machined normal (perpendicular) to the contour, there is also a setting that will allow the 3D feature to be machined in a “spiral” toolpath – beginning at the top, and continuing in one continuous spiraling motion, ramping down by a specified amount during each pass, until the final depth has been reached…producing a very efficient toolpath that closely mirrors the cutter path created by even the most advanced CAD/CAM package. Although we realize that even the most powerful conversational functionality - like Swept Surface - will never be a replacement for CAD/CAM systems, and that there will always be features that can only be machined with the advanced toolpath creation and full set of controls that these software packages offer, Hurco is confident that that a large percentage of the 3D work many job-shops will encounter could be easily programmed using this type of advanced software technology. We feel that being able to program these features on the shop floor is not only more efficient, but that it frees up the CAM programmers, and keeps them available for the more advanced geometry that would require their expertise. At Hurco we feel that flexibility is what really counts when producing parts, and HOW a customer ultimately decides to process a part is irrelevant. Our job is to supply them with the necessary tools to make the decision that works best for them, and to make sure that the tools we provide are as useful and as powerful as possible…and that is what we call, ”Mind Over Metal”.